a good sign for the economy in Japan? Each year during March millions of Japanese flock to various parks to enjoy “Flower Watching” (Hanami) with friends, colleagues or family. The timing is based around the seasonal blooming of the ubiquitous cherry blossoms that turn the landscape into amazing pink and white hues. In this edition of Asia Express, we will look into some of the finer points of this annual event. From as early as January the evening news broadcasts start to announce their predictions for the “full bloom” of the cherry blossom trees throughout Japan. This year Tokyo is expected to start to bloom on March 17 and be in full bloom around a week later – the full bloom only lasts around one week leaving a very narrow window for the people to enjoy “Hanami” or “Flower Watching”. Hanami usual comprises of a picnic sheet spread out under the splendour of a cherry blossom enjoying the change of seasons. Utilising our proprietary research panel of 2.3 million people in Japan, we asked about people’s plans for this years Hanami. 40.6% of the population has plans to attend at least one Hanami party. To put this in perspective, this means in Tokyo alone some 5 million people are expected to vie for key positions under the best trees in parks across the metropolis! This is up 3.8% when compared to the results of the same survey in 2017. Hamami is most popular with females in their 30’s (54.3% to attend) and Males in their 20’s (48.1% to attend). Will you attend a Hanami Party? Hanami is usually festive, day time event with ample food and drink. We asked what people are intending to budget for the party – and on average people will spend 2198 yen per person (USD20.77*). 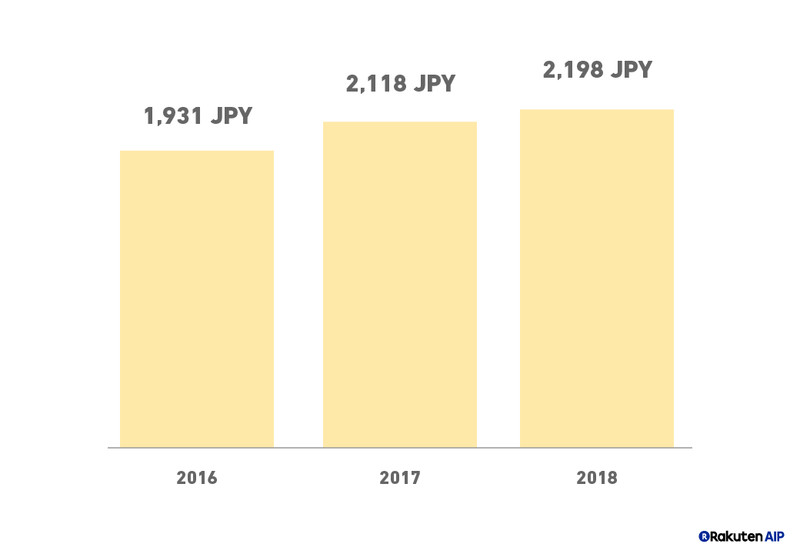 This continues an increasing trend over the past 3 years, up from 1931 Yen in 2016 and 2118 yen in 2017. 56.2% of people said that they will purchase pre-prepared food from a department store/supermarket/convenience store. 38.4% said that they will make their own food for the party. On the other hand, only 12.1% responded that they will use a food delivery service.